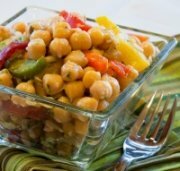 This is a delicious and healthy chickpea salad. It has a lovely mix of flavors, with the lemon juice and olive oil dressing and colorful vegetables. The parsley and mint add both flavor and nutritional value. This recipe is gluten free and vegetarian, as well as vegan if you omit the cheese. I hope you enjoy it this fabulous (and very healthy) salad recipe. In a small bowl, whisk together the garlic, oil, lemon zest, lemon juice and pepper to taste. In a large bowl, gently combine the chickpeas, mint, red onion, peppers and parsley. Pour the dressing over the chickpea mixture. Sprinkle the feta on the top and toss to combine. Taste and season with salt and additional pepper, if you think you need it. Serves 4 as a main dish or large side dish or up to 8 as a side dish serve with other salads. For great color use a mix of red, orange and yellow peppers. Add a bit of thinly sliced cucumber if you wish. A chick pea salad like this is so healthy for us and so versatile. Chick peas are the main ingredient in delicious hummus, a Middle Eastern spread. They are also wonderful in soups or sprinkled over any lettuce salad. Legumes and pulses are somewhat high in carbohydrates, so people with diabetes need to manage how much of them they eat, but the provide lots of fiber and protein and are naturally low in fat, so they are a great addition to any diet. This healthy salad recipe makes a great year round side dish or the main part of a vegetarian meal. If you like this chickpea salad you will love some of our other healthy recipes too. Find them here.